The second step is to create the RSS file. “RSS” stands for real simple syndication. Basically the RSS file is a file that provides information that creates an audio feed or podcast using information that you specify in the file. This can include article headlines, links to articles, and MP3 files (podcasts) among other things. To create an RSS file, you need a simple text editor, such as Notepad (Microsoft) on an IBMcompatible computer or SimpleText (Apple Computer) on a Mac. Do not attempt to use Microsoft Word to write an RSS file because it inserts data that will make the file invalid. RSS files have two main components. The first is the component and the second is the component. 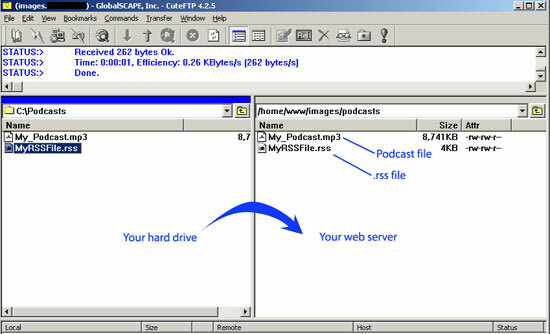 By defining these two components in an RSS file you can create a podcast. 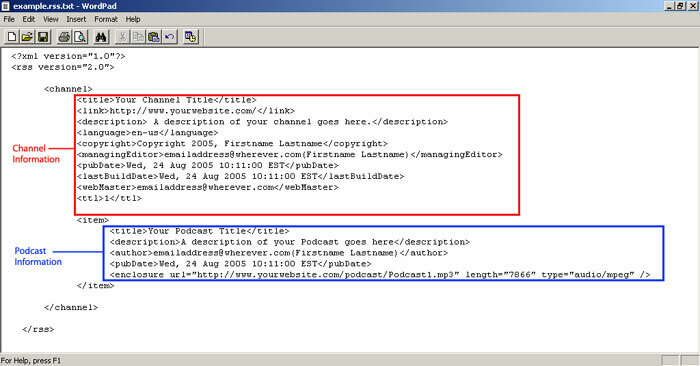 The component of the RSS file provides general information about the entity that is broadcasting the podcast. Some important subcomponents of the component are the following:, , , , , , , , and . Copy the text from Appendix 1 into Notepad or SimpleText. Thesubcomponent in Appendix 1 should contain the title of your channel, not the individual podcast (we will get to that later). The subcomponent should include a link to your Web site. The subcomponent is very important: When you submit your podcast channel to any sort of directory, the information that you provide here will be used to describe it. Word this section carefully and be sure to include important keywords that people might use to locate your podcast channel. The subcomponent lists the language in which the data will be delivered. The subcomponent lets users know who is responsible for the content of the channel. The editor’s e-mail address should be included and the editor’s name should be listed in parentheses. The subcomponent lists the copyright date and owner of the channel. The subcomponent gives the publication date of the channel. This is useful for those who wish to publish on a regular basis, like on a weekly basis. It is important that you list the date in the format listed in the example in Appendix 1; otherwise, your RSS file will be invalid. The subcomponent lists the last time that the content was updated. The subcomponent lists the e-mail address of a person whom users can contact in the event of technical problems with the channel. There are other subcomponents, but for our purposes we will define only those listed in Appendix 1. For a complete list of subcomponents, please see the RSS 2.0 specification here: blogs.law.harvard.edu/tech/rss. The component does not provide any actual content for the RSS file (i.e., the sound file for your podcast). To insert content— in this case, an MP3 file—you must insert the component of the RSS file. To do this, copy the text from Appendix 2 into your RSS file just after the subcomponent. In Appendix 2, the two components denote two separate podcasts, each with its individual title, link, and other information. All of the subcomponents (, , and ) are similar to those earlier described. The subcomponent lists the e-mail address and the name of the author of this particular podcast. The subcomponent denotes the actual podcast file and is very important. You must include the complete URL of the MP3 file that you placed on your server, its length (without the use of commas; the files in Appendix 1 and Appendix 2 are 6,808 kB and 9,724 kB, respectively), and the type of audio file, which, for our purposes, is an MPEG (MP3). The RSS file must be saved as a plain text file. Notepad may give the file a “.txt” file extension. You will need to remove this extension and rename the file with an “.rss” as the file extension (Fig. 1). Upload this file to your Web server using an FTP program and make note of its URL; this is the URL that you will give people who want to subscribe to your podcast (Fig. 2). Your Web server may not recognize the “.rss” file extension, which leads us to our next step: creating an .htaccess file. Fig. 2—We use the FTP program Fetch (Globalscape) to upload files to our Web server. Simply drag and drop the files into the preferred directory.